24/7 care for sensitive teeth. Specially formulated for people with sensitive teeth. Superior whitening action for sensitive teeth* *versus previous formulation. Number one dentist recommended brand for sensitive teeth. 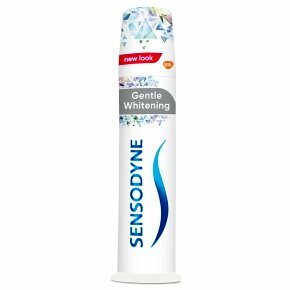 Dentists have been recommending Sensodyne for many years. Sensodyne Daily Care is a fluoride toothpaste which can be used everyday and provides daily care for sensitive teeth. Brush twice daily with Sensodyne Daily Care Gentle Whitening: Whitening designed for people with sensitive teeth Removes stains and polishes tooth surface Provides long lasting sensitivity care Provides all the benefits of a regular toothpaste In the unlikely event of pump failing, hold button down and firmly push up the inside base. When band reaches top, pump is empty. ALWAYS FOLLOW THE LABEL DIRECTIONS<br>Brush twice a day and do not more than three times, minimise swallowing and spit out. I irritation occurs, discontinue use. Do not use if you are allergic to any of the ingredients. Allergic reactions are very rare. If you experience swelling of the mouth or face, discontinue use immediately and talk to your dentist or doctor. Sensitive teeth may indicate an underlying problem that needs prompt care. If symptoms persist or worsen see your dentist. Keep out of reach of children. Not for use by children under 12 years of age unless on advice of a dental professional or doctor. Remove foil before use. Do not use if foil seal on the nozzle is broken.